The first settlers arrived from North India in modern day Sri Lanka in 5th century B.C. They spoke Prakrit a predecessor of Sinhalese. The first written Sinhalese documents date from the 3rd Century B.C. 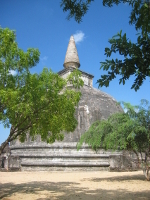 Modern Sinhalese began to develop from the 12th century A.D. onwards. Since that time the languages of the former colonial powers Holland, Portugal and Britain have had the most influence on Singhalese. Approximately 16 million people speak Sinhalese as a native language. The majority of them live on the island of Sri Lanka, with small groups of a few ten thousands living outside Sri Lanka most notably in North America, Australia, Western Europe and the Gulf states. The second language of Government in Sri Lanka is Tamil, which is spoken by about 4 million people in Sri Lanka. English is understood by the majority of people in Sri Lanka, but does not have the same importance as in other former British colonies. Sinhalese and Tamil are so different to each other that there are few people in Sri Lanka that speak both languages. The scripts of the two languages are also so different that learning either language from the other is very difficult. English is therefore often used by better educated people in Sri Lanka as a working language. Learning English is compulsory in Sri Lankan schools. The Sinhalese alphabet, like a lot of Indian scripts originates from the old Indian language Brahmi script. Sinhalese is the only language in the world written with this alphabet. Even for speakers of other Indian languages it is not easy to read. The alphabet consists of 58 letters, of which 42 are consonants and 16 vowels. A characteristic of Sinhalese is that every consonant has its own vowel built into it. Every consonant has the vowel “a” in its basic form, and the vowel is not written. If the consonant has another vowel behind it, a vowel sign is written into the consonant. The vowels are therefore not separate letters (except at the beginning of words) but instead added to the consonants and a part of the consonants. The reason for the curved appearance of the Sinhalese letters is historical. For centuries dried out palm leaves were used for writing. The letters were cut into the leaves with metal tools. With letters with straight lines or angular forms there was a greater danger that the leaves would tear and curved letters were easier to carve, and so the angular letters of the original Brahmi script developed to the curved forms seen to day in Sinhalese. Would you like to learn more about Sinhalese? We are delighted that you would like to learn more about Sinhalese. Can you write the Sinhalese alphabet? We have written a blog article on this theme. Would you like to learn the fifty most important words of Sinhalese? Would you like learn a bit more Sinhalese words? With 17 Minute Language's Sinhala Language Course you learn more than 450 words and phrases in this wonderful language. The online Encyclopedia Wikipedia has an interesting article about Sinhalese.